Sunglasses are such a fun and summnery wedding favor for your guests – especially if the wedding is being held outside. Who couldn’t use a cool pair of new shades? We have them in so many colors, black, white, pink, blue, yellow, orange, purple, – and coming later this week – gold! Personalize these sun glasses for a personal touch. Oh and we also see those cute striped tote bags too if you are looking for bridesmaid gifts. Strawberry jam is perfect for the upcoming spring and summer season and goes well with tea parties and wedding welcome bags. These particular Strawberry jam wedding favors come in 30 designs and 21 different colors. But we also have other themes such as english garden. rustic, beach and custom wedding designs. We’ve seen favor boxes, then we’ve seen favor boxes! How adorable are these our love story boxes shaped like books! Perfect if you’re a book lover or if you want to give a vintage inspired favor to your guests. A little sparkle, a little shine and a set of coasters is divine! Wedding favors can be pretty and practical like these silver sparkle glitter coasters. Plus they are as low as $2 per set, so you can’t go wrong! Even use them at each place setting to add sparkle to your tables. Gold is possibly the hottest color for 2016 – whether it be gold glitter or gold foil. And we love these gold lip balm wedding favors. Pick your design, select gold or silver foil, add your text and choose your lip balm flavor. These will get your guests ready for kissing! We love wine glasses, well, we just love wine – and having a collection of awesome wine glasses at home is great too. These are all new designs on our 15 oz wine glass wedding favors (we recommend this size, it’s the perfect fit in your hand) – in what they are being described as “rustic” monogrammed designs. You can personalize these bad boys in a plethora of colors – including gold and silver. You got it “write” by marrying your sweetheart, so why not give a useful pen as a token to remember your special day? Everyone uses pens and keeps them in a pocket, purse, home, office or car. These ball point pens are fun and the “write” wedding favor to give. Pop top personalized credit card bottle openers are pretty cool because they can fit in men’s wallets or women’s purses. They are the size of a credit card and have sturdy metal to pop the top of beer bottles and soda caps. And for about $1.00 they are affordable wedding favors too. Personalize in a number of colors and designs. One of our favorite items! Olive oil dipping plates are unique wedding favor that your guests can use every time they have an Italian dinner or entertain their guests in their homes. Personalized wedding matches have always been a traditional wedding favor, but these matchboxes have a whole new modern twist with their glitter or chalkboard labels (other designs available too). Mason Jars are so popular – they can be used for decor, lighting, holding utensils, drinks and even as wedding favors. A mason jar is a blank canvas – so many uses, so many ways to decorate them. If you’re planning on using mason jar favors (which are great for any occasion, not just weddings) we have 30 great ideas to fill your mason jars with. 1. Fill your mason jars with trail mix. Its healthy and festive with themed labels and matching bakers twine. 2. Popcorn in mason jars – caramel, plain, kettle corn, flavored – or even kernels to pop your own at home. 3. Cupcakes in a jar – be sure to add on a wooden chevron spoons so your guests will be able to eat their sweet treat on the way home. 4. Smores in a jar are great for rustic weddings, vintage events, birthday parties – and kids parties! 5. Cookie Mix in Jars – be sure to include a gift tag with instructions so your guests know how to mix and bake them! 6. Salt Water taffy favors in of course – mason jars! Use themed color taffy and ribbon and a tag for a special touch. 7. Peanut butter, almond butter, pecan butter is amazing easy to make! Make your own custom “butter” mix and label it with a personalized label. 8. Sugar scrubs are also an easy DIY craft and smell fresh in the bath or near a sink. Dress them up with labels for a wedding or bridal shower favor. 10. Caramel apples with dipping in a jar – this is adorable for DIY fall favors! 14. Succulents are popular for favors now, why not put them in little mason jars rather than little containers? 15. Terrariums are fun little landscapes you can make in jars. This may be a lot of DIYing for wedding favors, but may be cool as centerpieces! 16. Hot cocoa mix is a great fall and winter wedding favor idea. Add small bottles of liquor for the adults and add candy canes for the kids! 17. You can’t go wrong with candy in jars and it is probably one of the easiest DIY favors to do. Get some kisses, mints, almonds, jelly beans or M&Ms and fill away! 18. Whether you source local jam or jelly from a farmer or make your own (there are some really easy DIY recipes out there) jam is always a yummy treat for breakfast or dessert. 19. To ship honey favors to yourself, may be quite costly due to the weight. Not to mention if honey breaks in transit, all of your favors will be a mess. Skip the shipping and go to a local source or buy honey by the bulk and fill your own mason jars for an easy DIY rustic favor. 20. If you and your honey are a perfect match – here’s a twist on traditional matchbook favors – put wooden matches in a mason jar and glue to the top of the lid sandpaper or the cover of a matchbox so there is someplace for your guests to strike to light a match. 21. Send your fall or winter guests home with their very own mulling spices which are used to flavor hot apple cider, mulled wine, spiced beer or wassail. Spices usually consist of cinnamon, cloves, allspice, and nutmeg; and less frequently star anise, peppercorn or cardamon. It also usually includes dried fruit (such as raisins, apples or orange rind). You can also buy mulling spices prepackaged. 22. Homemade pickles are a unique favor. You can make these ahead of time using your own pickling recipe and fresh cucumbers – add a little burlap, bakers twine and a kraft tag stamped with your logo and voilà! favors! 23. Make your own candles. Using painters tape, you can create your own stencil. Simply paint (spray paint works the quickest and best!) chalkboard paint on them, let dry and remove the tape. Instant rustic decor or favors. 24. Homemade granola is quick, easy and a healthy snack. Follow the source link for the recipe. 25. Doughnut or donut holes are the perfect snack to pop at the end of the night. You can buy them premade or follow the source link above to find the recipe for the superfood chocolate bliss balls found in the photo. 26. Bath bombs in mason jars – could be the perfect gift for your bridal shower guests or as a little extra pampering to your bridal party girls. 27. A sewing kit in a jar is a unique gift – especially if you are “sew perfect together”. Also cool to give to your out of town guests in their welcome baskets. Or carry one in your emergency wedding day kit for day of wedding repairs. 28. If you’re crafty you can make your very own scented soy candles and use mason jars as holders for them. 29. If you’re having a farm to table wedding like the couple above did, they used mason jars to hold individual servings of olives. What a unique idea! 30. Finally, if you’re still not sure what to fill your DIY mason jars with for favors, why not just give the mason jar itself as a favor? Do what these couples did and have them use their jar as their glass for your wedding – and they can take them home! Are you using mason jars for your wedding? What will you be filling them with? Don’t forget to follow our Mason Jar Pinterest Board which has over 80+ unique ideas (and growing) for your wedding favors and decorations. Pantone announced last month, that the 2014 color of the year is Radiant Orchid. Since the announcement we’ve seen an explosion of photos of this awesome color. Radiant is a perfect name for this shade of orchid! Bright and lovely, it is perfect for spring and summer weddings. Add a richer, deeper shade for fall and winter 2014 weddings. It is said to compliment all skin tones and work well with a variety of accent colors: purples, lavenders, pinks, turquoise, red, yellows and all neutral shades. We’ve put together for the bride searching for radiant orchid accessories a page of wedding favors and supplies which currently matches this awesome color, you can find all of our radiant orchid wedding items here which are all on sale at this moment for 20% off our regular prices. (Sale ends, January 14, 2014). Also, if you’re looking for radiant orchid wedding inspiration, be sure to follow our Radiant Orchid Pinterest Board which has over 100 ideas for you! On the second day of Christmas your true love may send you two turtle doves but the staff here at Little Things Favors would like to extend you an offer of 15% OFF our Best Selling Favors. Get all your holiday party needs right here!! Happy National Chocolate Cupcake day! Did you know that today we celebrate these scrumptious little morsels of sweet goodness? We at Little Things, LOVE chocolate – we don’t need a holiday to enjoy it – any day will do to indulge in chocolate in our office. That’s why we were delighted when we found out there is a day that we can celebrate by eating more chocolate! 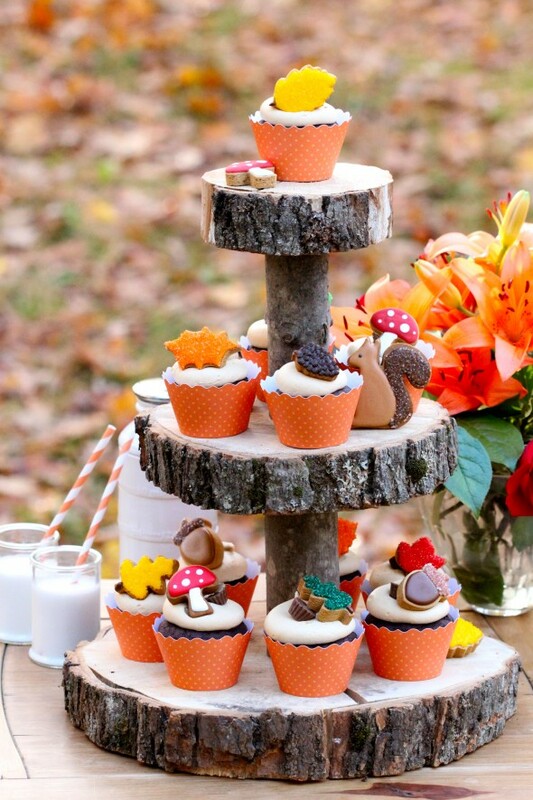 Cupcakes are so fabulous for so many events – parties, showers and yes, even weddings. They are simple to make, easy to decorate and fun to eat. Just look at these gorgeous little treats – any guest would be happy to eat one of these bad boys! If you’re not a baker, (and its ok, not everyone is) go ahead and buy a better than average cupcake mix in a grocery store (I can vouch that BJs carries delicious Ghirardelli cupcake mix and frosting that is big enough to make a batch for a party) and whip some up for your next party. Also purchase a frosting bag kit (I personally use Wilton’s Cupcake Decorating Set) which makes it easy to pipe out your frosting like a pro. Trust me if you can move your wrist in circles, you can make cupcakes that look exactly like these shown. Decorate with a little sugared glitter and use something like our Lace Hearts Filigree Paper Cupcake Wraps to dress them up. Don’t forget if you are having a formal affair like a wedding, you’ll also want to offer personalized cocktail napkins and a pretty display stand for guests to ogle over your little treats. And if you want your guests to take home one of them as their wedding favors, you also will need some pretty boxes to carry them home in such as our Cupcake Favor Boxes set. We love peanut butter and chocolate combinations and just looking at Sweetopia’s blog makes me want to go home and whip up a batch tonight. As a matter of fact she’s got her Chocolate Cupcakes with Peanut Butter Icing recipe listed over there as well for these cupcakes so if you’d like to try your hand at baking, these sound like a yummy way to start.